By letting your customers choose their price. And I’ll show you exactly how to do it. I starting selling eBooks using a Pay What You Want model back in April of 2013. In less than a year, I’ve brought in over $4,000 from Pay What You Want products. Let me repeat that: I’ve made $4,000+ from books I give away for FREE. It’s also important to realize that I did most of this in my spare time while working a full-time job. 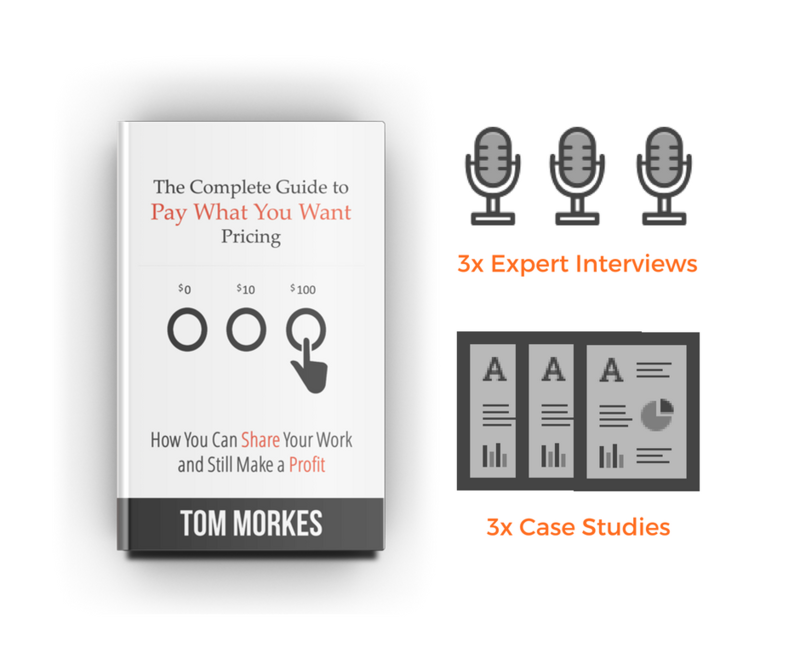 In The Complete Guide to Pay What You Want Pricing, I explain the exact steps I took (and the same steps OTHERS have taken) to create such remarkable revenue from such an unorthodox pricing model so you can have the same success. You might be thinking this is a one-off example; that my experience was an anomaly, or that it can only work in certain niches under certain conditions. I thought this way myself for a while. After all, if Pay What You Want is really this powerful, why don’t more people use it? 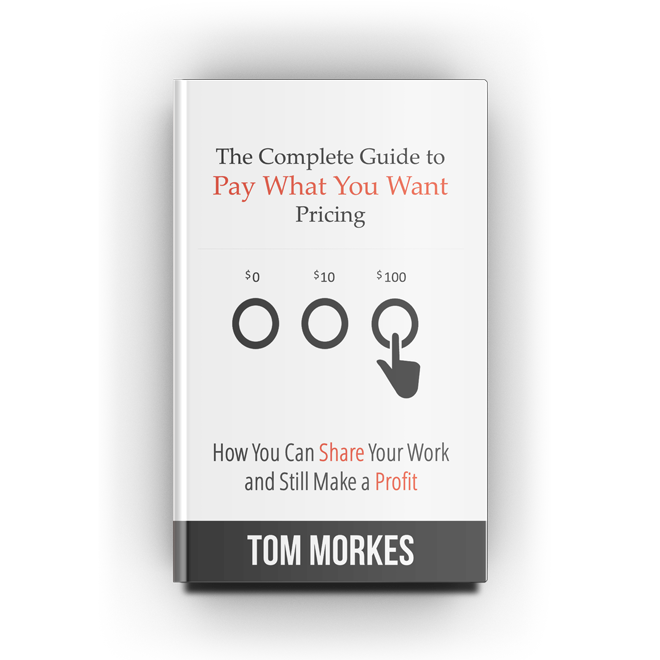 That’s the question I wanted answered, and it’s the question that fueled my new book, The Complete Guide to Pay What You Want Pricing: How You Can Share Your Work and Still Make a Profit. If you care about putting Pay What You Want to work and actually making money from it (while delighting your customers at the same time), The Complete Bonus Package is what you’re looking for. 3+ Expert Interviews: Get inside the heads of entrepreneurs and artists who are using Pay What You Want models to make an impact (and a killing financially). We have 3 so far with more on the way. The Essential PWYW Checklist: miss any of these steps and your Pay What You Want offering won’t work. The PWYW Quick Offer Video Tutorial: a video tutorial designed to show you how to start making money by sharing your work online today (no business or website necessary). Simple PWYW Ecommerce Website Creation Video Tutorial: There are a lot of ways to spend a lot of money online for a nice website, but what if you just want to get your work out there so people can contribute? This video tutorial will show you how to setup a website (for free) and start selling products in 5 minutes. The Pay What You Want Scripts Guide: copy and paste these scripts when making an offer to a client or selling a product and be certain you’re making the best offer possible to maximize your return using Pay What You Want. 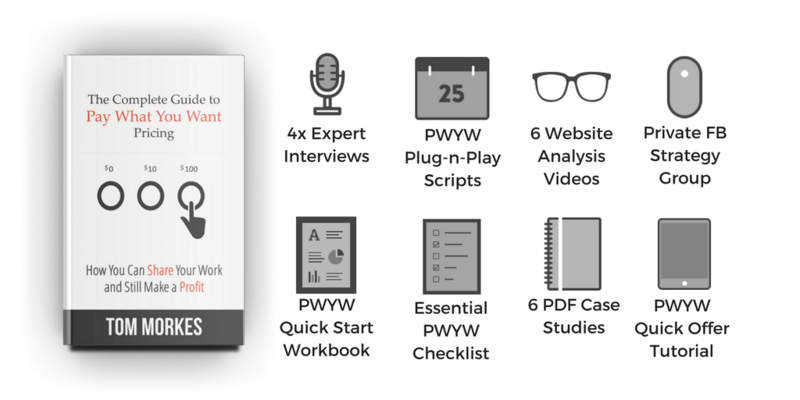 The PWYW Quickstart Workbook: use this along with the guide to craft a compelling PWYW offer that increases your credibility, adds value to your existing products and services, spreads your message farther (and cheaper) than conventional advertising, and increases revenue. Private PWYW Facebook Group: learn from others using PWYW to (1) sell their art, (2) make money from a hobby and (3) build generosity based businesses. What Are All These Bonuses Worth? I know because I’ve bought them. But in the spirit of PWYW, I want to lower the barrier to entry, while still rewarding those who generously contribute to my creative work. If you can afford $249, consider all the good karma you’re sending the way of others who can’t quite afford it. Your contribution goes straight into new products and services that I try to give generously to everyone. If you can’t afford $249, contribute what you can and then make sure to pass on the generosity to others. Tom Morkes is one quarterback confident enough to show everyone on the field his playbook, not just his teammates. The Complete Guide to Pay What You Want Pricing (just the guide) has everything you need to learn and implement PWYW pricing. I spent the bulk of my time making this guide standalone and powerful. I literally spent hundreds of hours creating it and I’m completely confident it will help you increase your revenue, reach and impact. A guide like this could reasonably be priced at $39 or more (I’ve paid more for less comprehensive guides), but in the spirit of Pay What You Want, I’m making this available for less than a cup of coffee at your local coffee shop. Get The Complete Guide to Pay What You Want Pricing (just the guide) today. Fixed-price products by their nature create a barrier to entry for consumers. By lowering the price to zero, you remove the barrier to entry. Yet, while free destroys revenue, PWYW does not — people still contribute, and often more generously than you’d imagine. Based on the results of multiple uses of Pay What You Want, Ryan discovered that the top 1-3% of our audiences contribute way over the average — so much so that they often more than make up for those who contribute the minimum. When I released “Notes From Seth Godin’s Revolution Conference,” the majority of tips I received came from the top 3% of my audience who contributed $50 to $100 per download. When the rule is ‘Pay What You Want,’ almost everyone pays something. The study goes on to explain that 95.95% of customers contribute money when paying is optional. The question is…how MUCH do those 95.95% actually contribute. Matt Homann of LexThink is a consultant for lawyers, accountants and large corporations like Microsoft. Ready to sell more generously?